Both the File Ages Chart and the Main Chart can be saved to disk in one of the standard image formats (JPG, BMP, or TIFF). To do this, you can either select an appropriate item from the "File" main menu, or click on the floppy disk icon on the toolbar of a corresponding window. Note that the saved image does not have to have the same dimensions as the chart being displayed, and can be made larger or smaller according to your preferences. 1. 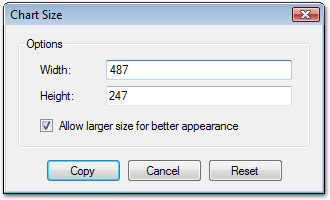 The chart size dialog box (see below) will appear; this lets you determine the desired chart size to save to file. If you like the current size, just click "OK" button. 2. Select the location to save to, as well as the format to save the image in. 3. Any format-specific options, such as compression level for JPEG images, will appear afterwards.